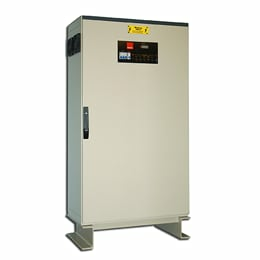 DC battery systems automatically provide an alterative power supply in the event of AC supply failure. Our systems can be customised to meet a site’s requirements – a wide range of standard ratings are available, and the system is compatible with an extensive selection of batteries with design lives of up to 25 years. Comprehensive instrumentation and monitoring functions are included as standard. Our DC battery systems are designed to comply with BS EN 50171:2001. Please contact your Business Manager to discuss further.